As a local business owner, it’s important for your business to be listed in Google’s search results. But how do you fix your business listing if the information is incorrect? 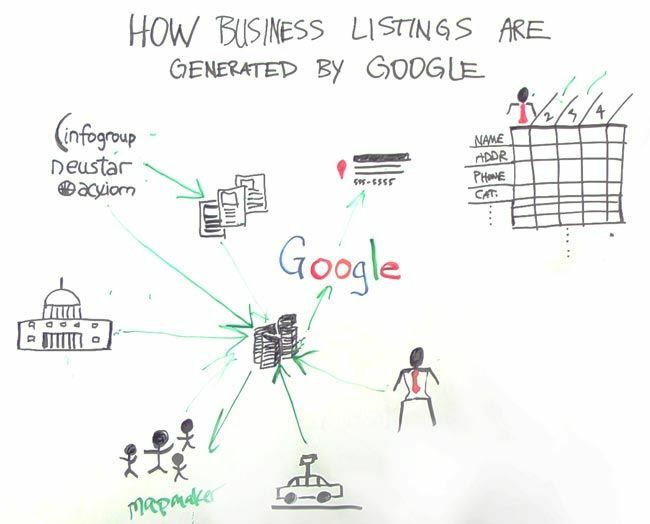 In this week’s edition of Local Whiteboard Friday, David Mihm sheds some light on the complicated process that Google uses to create its business listings. For reference, here’s a still of David’s whiteboard diagram. So they type in the name of their business, and there’s either a phone number wrong or their address is wrong or sometimes the marker for where their business is, is in the wrong place. So I want to try to answer how Google generates its business listings. So the first step that a lot of business owners take, which is a great step to take, is they go directly to Google. Google offers a dashboard for businesses that Google Places as well as Google+, there are kind of two ways into it right now. A business owner goes and he enters his business name, his address, his phone number, some categories, maybe the hours that he operates his business, and he tells that directly to Google. Of course the expectation is, “Oh well, I’m the business owner. I’m telling Google this information. That’s how it should show up when Google spits out a search result.” But in reality that’s not actually how Google assembles a business listing. So I’m going to erase these lines, and I’ll try to walk you guys through how this process actually happens. So for many of you, if you’re business owners, you go to one of these places, the Google Places dashboard or the Google+ local dashboard, and you tell Google about your business and you find before you even get there Google knows about your business. It can guess at what your address and phone number are for example. So you might wonder where Google is finding that information. Actually in the United States there are three companies that aggregate business data for United States businesses. Again, this is the United States only, but in this country those guys are Infogroup, Neustar and Axiom. So Google buys or leases information from at least one of these companies and pulls it into its index. But it doesn’t go right into Google’s index. It actually goes into a massive server cluster that takes it into consideration as one data source. That all gets assembled at a server cluster, somewhere in Mountain View let’s just say, that compiles kind of all of this information. These however, aren’t even the only places that Google gets data. These guys, these data sources actually also, in addition to sending information to Google, they send data out to a whole bunch of other sites across the web. So Yelp, for example, gets information from one of these sources. Yellowpages.com gets information from one of these sources. Many of you guys have seen my local search ecosystem infographic that kind of details a little bit more about how this process works. Additionally, in addition to these data aggregators, in addition to websites, Google looks at government information. So if you’re regional, like your county has a place of businesses that are registered in a particular county or maybe your secretary of state, Google is either probably going to crawl that information. In some cases the government publishes this in PDF format or something like that, and that gets pulled into this cluster again as one of these data points in this huge spreadsheet. Another place that Google might get information believe it or not is Google Street View. Bill Slawski of SEO by the Sea recently gave a keynote at Local University in Baltimore, and there’s information in Googleâs patents that suggest that street view cameras from these cars that they go out and they drive around trying to find driving directions are taking photos of storefronts with business name signage, with the address numbers right there on the storefront, and that information gets pulled into this, what we call the cluster of information. So there are all these different sources pulling in, and you as the business owner, you are only one of these data sources. So even though you tell Google, “Hey, yes this is my address, this is my phone number, this is where I’m located,” if Google is seeing bad information, at any of these other places from these data aggregators, from websites, from government entities, Google pulls data in from everywhere. So if every other source out, there or a lot of other sources out there that Google trusts, especially major data aggregators or government entities, if they have your information wrong, that could lead to misinformation in the search results. But thereâs one final step actually before Google will publish the information, the authoritative information from this cluster. Google actually has human reviewers that are looking at this information. They are calling businesses to verify things like categories, the buildings that certain businesses are located in, and these reviewers will again call a real business offline. So if you get a call and it says, “Hey, Mountain View is calling you, it might actually be Google.” So pay special attention if your business receives those kind of calls. They might be trying to validate information that they’re finding from across the web. The other thing to keep in mind is that Google accepts data from other reviewers, from other human reviewers via a website that it operates called Google Map Maker. So if you’re having trouble with your information from one of these sources, you might check Google.com/mapmaker. It’s like a Wikipedia for locations. Anybody in the world can go in there and update data. So it’s really, really important if you’re a business owner and you’re having trouble with Google publishing bad information about your business, you can’t just go into the Google Places dashboard or the Google+ dashboard and fix this information. You really need to go to all of these different sources. So these major data aggregators, they’re different in every country. So if you’re from somewhere else in the world besides the United States, you need to do some research on who these guys are. You need to update your information at Internet yellow pages sites. You definitely need to update your information with government authorities, and you probably want to check your information at least on this Google Map Maker site, because all of these feed into this central data cluster that then feeds into a Google search result for your business. So I hope that explains a little bit about this very complicated process that Google has to assemble business listings. If you want more information in the text part of the page on which this Whiteboard is published, I’ll reference one of my colleagues at Local University, Mike Blumenthal. Mike has a great sort of text based layout of what I just explained visually, and Mike is actually the inspiration for this idea of the data cluster at Google Local. So hope you enjoyed that Whiteboard Friday, and again for more information I’ll link to Mike Blumenthal’s blog down near the comments. Personalization usage data and user data give marketers deep insights into their users' interests and actions. But how can you make the most out of these complex data sets to better serve your SEO campaigns? In this week's Whiteboard Friday, Rand takes us through the intricate world of personalization and how it affects SEO. We'd love to hear your thoughts and tips in the comments below! "Howdy, SEOmoz fans. Welcome to another edition of Whiteboard Friday. This week I'm wearing a hoodie and a T-shirt, so it must be informal. I want to take you in a casual fashion into the topic of personalization user data and usage data, and these are complex topics. This Whiteboard Friday will not be able to cover all of the different areas that user and usage data and personalization touch on. But what I do hope to do is expose you to some of these ideas, give you some actionable insights, and then allow you guys to take some of those things away, and we can point to some other references. 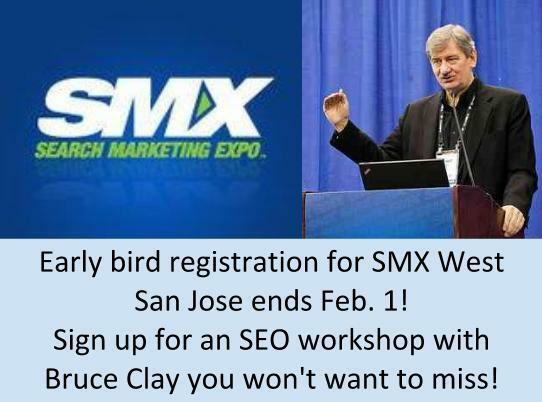 There are lots of folks who have done a good job in the search world of digging in deep on some of these other topics. Let's start by talking about some of the direct impacts that personalization usage data have. Of course, by personalization usage data I mean the areas where Google is showing you or other users specific things based on your usage activities, where they are leveraging usage data, broad usage data, for many users to come up with different changes to these types of search results, and where they're leveraging user personalization on a macro level, taking the aggregate of those things and creating new types of results, re-ranking things and adding snippets. I'll talk about each of those. In these direct impacts, one of the most important ones to think about is location awareness. This is particularly important obviously if you're serving a local area, but you should be aware that location biases a lot of searches that may not have intended to be local simply by virtue of their geography. If you're at a point, if I'm here in downtown Seattle, there is location awareness that affects the results ordering. I can perform searches, for example for Coffee Works, and I will get these Seattle Coffee Works results. Perhaps if I was in Portland, Oregon and they had a Coffee Works in Portland, I would be getting those Coffee Works results. Usage history also gives Google hints about your location, meaning that even if you're searching on your smartphone or searching on your laptop, and you said, "Don't share my location," Google and Bing will still try to figure this out, and they'll try to figure it out by looking at your search history. They'll say to themselves, "Hey, it looks like this user has previously done searches for Madison Markets, Seattle Trader Joe's, used our maps to get directions from Capitol Hill to Queen Anne. I can guess, based on that usage data, that you are in Seattle, and I will try and give you personalized results that essentially are tied to the location where I think you're at." A fascinating example of this is I was searching on my desktop computer last night, which I have not made it location aware specifically, but I did a search for a particular arena in Dublin, which is where the DMX Conference, that I'm going to in a couple days and speaking at, is going to be held. Then I started typing in the name of the hotel I was at, and it's a brand name hotel. What do you know? That location came up, the Dublin location of the brand hotel, even though that hotel has locations all over the world. How do they know? They know because I just performed a search that was related to Dublin, Ireland, and therefore they're thinking, oh yeah, that's probably where he's looking for this hotel information as well. Very, very smart usage history based personalization. Do be aware search suggest is also affected directly by personalization types of results. If you are doing a search that is going to be biased by some element of personalization, either your search history or your location, those kinds of things, auto-suggest will come up with those same biases as the rankings might. Next, I want to talk about the semantics of how you perform queries and what you're seeking can affect your search as well. Search history is an important bias here, right? Basically, if I've been doing searches for jewelry, gemstones, wedding rings, those kinds of things, and I do a search for ruby, Google and Bing are pretty smart. They can realize, based on that history, that I probably mean ruby the stone, not Ruby the programming language. Likewise, if I've just done searches for Python, Pearl and Java, they might interpret that to mean, "Aha, this person is most likely, when they're searching for Ruby, looking for the programming language." This makes it very hard if you're a software engineer who's trying to look for gemstones, by the way. As you know, the ruby gem is not just a gem. It's also part of the programming protocol. This gets very interesting. Even seemingly unrelated searches and behavior can modify the results, and I think this is Google showing their strength in pattern matching and machine learning. They essentially have interpreted, for example, as disparate things as me performing searches around the SEO world and them interpreting that to mean that I'm a technical person, and therefore as I do searches related to Ruby or Python, they don't think the snake or the gemstone. They think the programming language Python or the programming language Ruby, which is pretty interesting, connecting up what is essentially a marketing discipline, SEO a technical marketing discipline, and connecting up those programming languages. Very, very interesting. That can modify your results as well. Your social connections. So social connections was a page that existed on Google until last year. In my opinion, it was a very important page and a frustrating page that they've now removed. The social connections page would show, based on the account you were inside of, all your contacts and how Google connected you to them and how they might influence your search results. For example, it would say randfish@gmail.com,which is my Gmail account that I don't actually use, is connected to Danny Sullivan because Rand has emailed Danny Sullivan on that account, and therefore we have these accounts that Danny Sullivan has connected to Google in one way or another. In fact, his Facebook account and several other accounts were connected through his Quora account because Quora OAuths into those, and Google has an agreement or whatever, an auth system with Quora. You could see, wow, Google is exposing things that Danny Sullivan has shared on Facebook to me, not directly through Facebook, but through this protocol that they've got with Quora. That's fascinating. Those social connections can influence the content you're seeing, can influence the rankings where you see those things. So you may have never seen them before, they may have changed the rankings themselves, and they can also influence the snippets that you're seeing. For example, when I see something that Danny Sullivan has Plus One'd or shared on Google+, or I see something that Darmesh Shah, for example, has shared on twitter, it will actually say, "Your friend, Darmesh, shared this," or "Your friend, Danny Sullivan, shared this," or "Danny Sullivan shared this." Then you can hover on that person and see some contact information about them. So fascinating ways that social connections are being used. Big take-aways here, if you are a business and you're thinking about doing marketing and SEO, you have to be aware that these changes are taking place. It's not productive or valuable to get frustrated that not everyone is seeing the same auto-suggest results, the same results in the same order. You just have to be aware that, hey, if we're going to be in a location, that location could be biasing for us or against us, especially if you're not there or if something else is taking your place. If people are performing searches that are related to topics that might have more than one meaning, you have to make sure that you feel like your audience is well tapped into and that they're performing searches that they are aware of your products getting more content out there that they might be searching for and building a bigger brand. Those things will certainly help. A lot of the offline branding kinds of things actually help considerably with this type of stuff. Of course, social connections and making sure that your audience is sharing so that the audience connected to them, even if they're not your direct customers, this is why social media strategy is so much about not just reaching people who might buy from you, but all the people who might influence them. Remember that social connections will be influenced in this way. Right now, Google+ is the most powerful way and most direct way to do this, but certainly there are others as well as the now removed social connections page, helped show us. What about some indirect impacts? There are actually a few of these that are worth mentioning as well. One of those indirect impacts that I think is very important is that you can see re-ranking of results, not just based on your usage, but this can happen or may happen, not for certain, but may happen based on patterns that the engines detect. If they're seeing that a large number of people are suddenly switching away from searching ruby the gemstone to Ruby the language, they might bias this by saying, "You know what, by default, we're going to show more results or more results higher up about Ruby the programming language." If they're seeing, boy a lot of people in a lot of geographies, not just Seattle, when they perform a Coffee Works search, are actually looking for Seattle Coffee Works, because that brand has built itself up so strongly, you know what, we're going to start showing the Seattle Coffee Works location over the other ones because of the pattern matching that we're seeing. That pattern matching can be a very powerful thing, which is another great reason to build a great brand, have a lot of users, and get a lot of people around your product, your services, and your company. Social shares, particularly what we've heard from the search engines, Bing's been a little more transparent about this than Google has, but what Bing has basically said is that with social shares, the trustworthiness, the quality, and the quantity of those shares may impact the rankings, too. This is not just on an individual basis. So they're not just saying, "Oh well, Danny Sullivan shared this thing with Rand, and so now we're going to show it to Rand." They're saying, "Boy, lots of people shared this particular result around this topic. Maybe we should be ranking that higher even though it doesn't have the classic signals." Those might be things like keywords, links, and all the other things, anchor text and other things that they're using the ranking algorithm. They might say, "Hey the social shares are such a powerful element here, and we're seeing so much of a pattern around this, that we're going to start re-ranking results based on that." Another great reason to get involved in social, even if you're just doing SEO. Auto-suggest can be your friend. It can also be your enemy. But when you do a search today, Elijah and I just tried this, and do a search for Whiteboard space, they will fill in some links for you – paint, online, information. Then I did the same search on my phone, and what do you think? Whiteboard Friday was the second or third result there, meaning, they've seen that I've done searches around SEOmoz before and around SEO in general. So they're thinking, "Aha. You, Rand, you're a person who probably is interested in Whiteboard Friday, even though you haven't done that search before on this particular phone." I got a new phone recently. That usage data and personalization is affecting how auto-suggest is suggesting or search suggest is working. Auto-suggest, by the way, is also location aware and location biased. For example, if you were to perform this search, whiteboard space, in Seattle, you probably would have a higher likelihood of getting Friday than in, let's say, Hong Kong, where Whiteboard Friday is not as popular generally. I know we have Hong Kong fans, and I appreciate you guys, of course. But those types of search suggests are based on the searches that are performed in a local region, and to the degree that Google or Bing can do it, they will bias those based on that, so you should be aware. For example, if lots and lots of people in a particular location, and I have done this at conferences, it's actually really fun to ask the audience, "Hey, would everyone please perform this particular search," and then you look the next day, and that's the suggested search even though it hadn't been performed previously. They're looking at, "Oh, this is trending in this particular region." This was a conference in Portland, Oregon, where I tried this, a blogging conference, and it was really fun to see the next day that those results were popping up in that fashion. Search queries. The search queries that you perform, but not just the ones the you perform, but the search queries as a whole, kind of in an indirect, amalgamated, pattern matching way, may also be used to form those topic models and co-occurrences or brand associations that we've discussed before, which can have an impact on how search results work and how SEO works. Meaning that, if lots of people start connecting up the phrase SEOmoz with SEO or SEOmoz with inbound marketing, or those kinds of things, it's very likely or you might well see that Google is actually ranking pages on that domain, on SEOmoz's domain, higher for those keywords because they've built an association. Search queries, along with content, are one of the big ways that they put those topics together and try to figure out, "Oh yeah, look, it seems like people have a strong association with GE and washer/dryers, or with Leica and cameras or with the Gap and clothing." Therefore, when people perform those types of searches, we might want to surface those brands more frequently. You can see this in particular when you perform a lot of ecommerce-related searches and particular brands come up. If you do a search for outdoor clothing and things like Columbia Sportswear and REI and those types of brands are popping up as a suggestion, you get a strong sense of the types of connections that Google might build based on these things. All right, everyone. I hope you've enjoyed this edition of Whiteboard Friday. I hope you have lots of great comments, and I would love to jump in there with you and suggestions on how you people can dig deeper. We will see you again next week."